One of our favorite spots in all of Disneyland is Jolly Holiday Bakery. We never get tired of looking through their pastry cases for something new to delight us! And right now, they’re stepping up their game with some new, limited-time offerings. Jolly Holiday obviously has a Mary Poppins theme, and this adorable Spoonful of Sugar offers a lot of flavor AND visual interest in one bite! 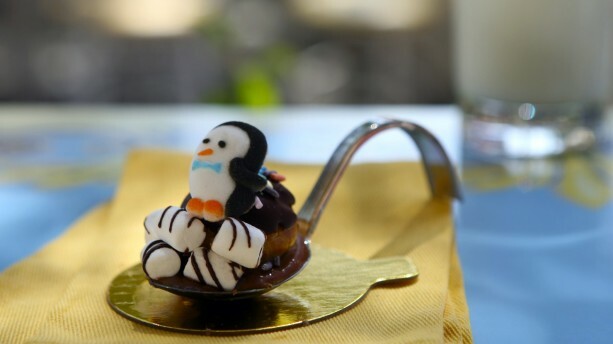 The treat includes pâte à choux, chocolate caramel ganache, sprinkles, chocolate pastry cream, dark chocolate, white chocolate, a tiny penguin made from sugar, and marshmallows! Whew! That’s a LOT of detail! If you love the looks of this little guy, you better get to Disneyland quick — he’s only available August 22-31! But there are several other pastries and desserts making a limited time appearance at Jolly Holiday Bakery. Look for these to stick around into September. 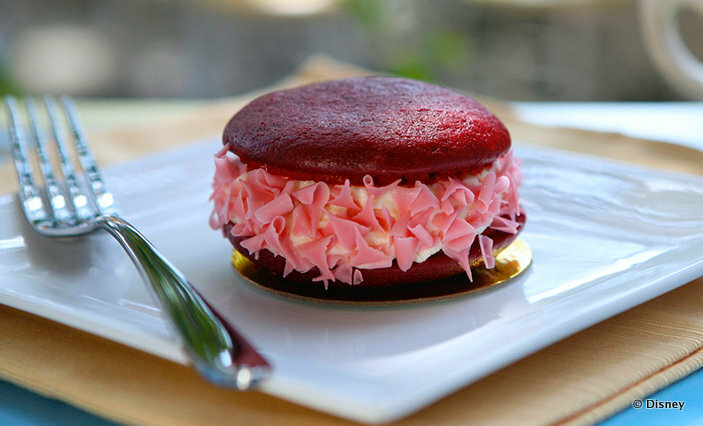 Get a load of this gorgeous Red Velvet Whoopie Pie! Recently, our Dining in Disneyland columnist Heather Sievers showed us some of the other delicious new treats that are available now through September at Jolly Holiday. 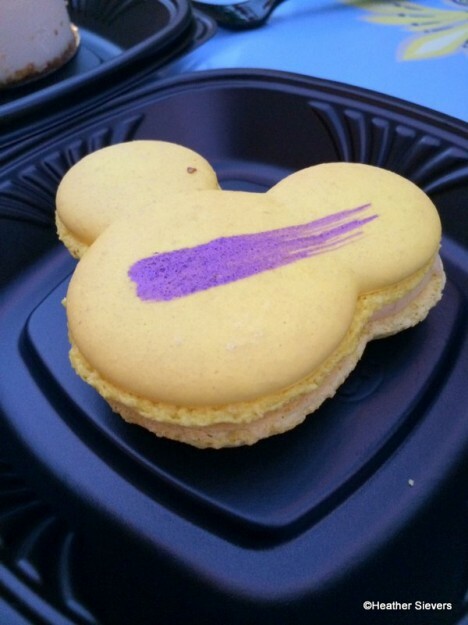 We fell in love with the Mickey-Shaped French Macarons. The Passionfruit Macaron is sweet with more sweet, but we love the sparkly embellishment on top. Mac and Cheese! 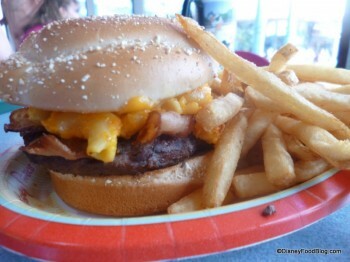 For a dose of one of our favorite comfort foods, stop by Electric Umbrella in Epcot’s Future World for the new Macaroni and Cheese Burger. We continue to keep up on the latest technology introduced at Disney restaurants. This week, we reviewed the new iPad wine list at Victoria & Albert’s at the Grand Floridian! 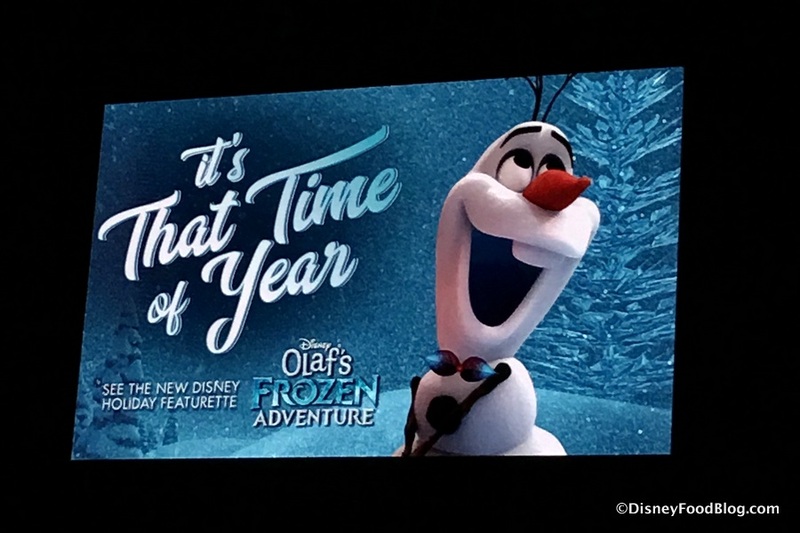 Catch up on all the food news from Disney! There’s a new menu item at Epcot’s Electric Umbrella — the Macaroni and Cheese Burger. Check out the new iPad wine lists at Grand Floridian Resort’s Victoria and Albert’s restaurant! 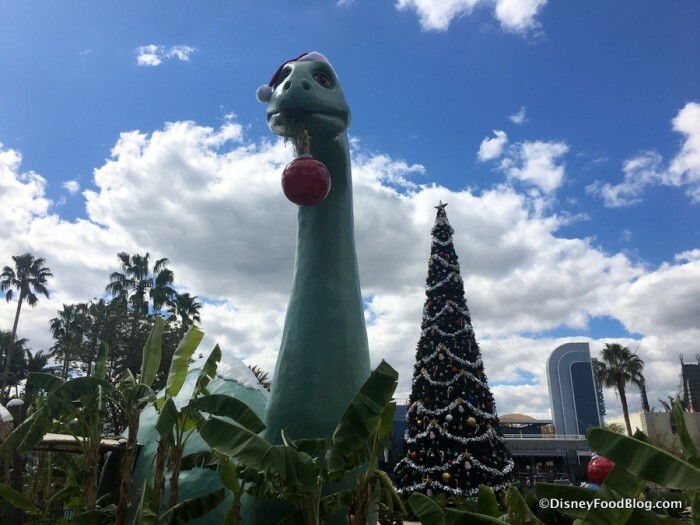 Universal Studios and Islands of Adventure are now offering a Dining Plan when booking a vacation package. Of course, there’s more! Check out all the latest Disney Food News — even the stuff we don’t mention in posts on the blog! — on our Disney Food News Pin Board, including Disneyland’s Harbour Galley debuted new menu items, Disneyland’s September gourmet candy apple flavor, and more. DFB Guest Author Corey shared one of his favorite treats – sprinkled marshmallows – from the Magic Kingdom’s Main Street Confectionery!